Pooh-poohed by most experts as money-wasting (and possibly dangerous) psychological massage, oxygen bars are nonetheless expanding their reach, from dugouts to mountain spas. Why? Artificial intelligence is everywhere. For me, that means the operating room—and for you, the patient, it means that your surgeon is not alone. While there are varying statements on how much protein a person needs each day, my observation is that those levels are far too low when you are injured or sick. And, they are probably too low to keep you from getting injured and sick. We all do stupid things. I try not to do them too often. And I try to limit my stupid activities to those with minimal consequences. Stay vertical on the bike. If falling, roll with the fall. And, if it ain’t broke, don’t break it. Running is safe. No joint is injured solely by running, despite what you may have heard. Running only damages already damaged joints. 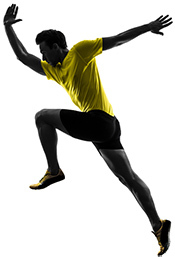 You can run forever if you have healthy joints and good running mechanics. Accuracy is one of the key measures of fitness, but it’s one that we frequently underestimate. So you’ve made your New Year’s resolutions. You have probably made some every year. How many of them have you kept? Forget about privacy. Accept the fact that all things digital are public. The fact is indisputable. What’s the secret to fast, effective healing? Teamwork. Excellence isn’t a given—it’s an achievement. The stem cell field as a whole has become crowded with companies proclaiming remarkable results. Unfortunately, many of the products offered lack stringent quality control. Just what is glucosamine—and is the supplement really an effective treatment for arthritis? You may be surprised. Microfracture surgery fails at an alarming rate ending the careers of many pro athletes. Fortunately, there are alternatives. Every surgeon has a different skill set—and it’s important that their preferences align with yours.